Millions of Americans are facing old age essentially alone. One in three baby boomers is single or no longer part of a couple due to divorce or death. Others may be in a relationship where chronic illness has struck both partners simultaneously. Children may live too far away or lack the resources to offer a parent meaningful help. But there is no reason why circumstances like these should bar anyone from a quality old age. It just takes planning, which is where this empowering book comes in. Full of helpful checklists and worksheets, Who Will Take Care of Me When I’m Old? 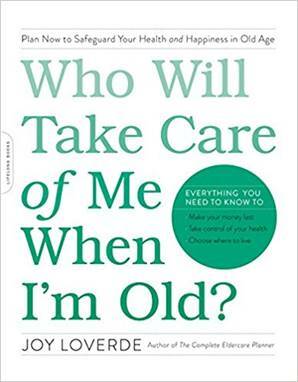 is an essential guide to preparing for and navigating the inevitable losses that aging entails – the loss of functioning, the loss of loved ones and friends, and the loss of income. The book then turns to the planning work at hand. An early chapter deals with how to stay afloat financially. Near the top of the list are getting one’s legal affairs in order, including consulting with an elder law attorney. Loverde suggests ways to create an income stream in retirement and lists scores of job possibilities. She even has recommendations for lowering grocery bills. Succeeding chapters present ideas and resources for successfully aging in place alone, exploring housing options both in the U.S. and abroad, coping with widowhood, “foraging for a family,” staying connected with those you know and making new friends, and evaluating medical providers. One chapter is devoted to considerations in adopting a pet. Throughout the book, Loverde provides names of helpful organizations, and one fun feature is that each chapter ends with one recommended book, YouTube video, movie, song and TED Talk on that chapter’s topic. Near the end Loverde includes a multi-page goldmine of useful websites (ElderLawAnswers among them). This is not the kind of book anyone looks forward to reading, but it is a book that is essential reading for anyone who wants to start laying the groundwork now for the best possible old age. To read more about Who Will Take Care of Me When I’m Old?, click here.